Because so many notable business pundits appear to be bemused by America’s most recent economic vexation, specifically the collapse of the mortgage markets; I thought I’d take a crack at edifying your readers, to the extent I’m capable, as to its true nature and causes. To begin with one must remember that all the statistics kept on our economy are bogus. They are contrived in such a manner, compiled explicitly for casual regurgitation, so as to never display anything less than full employment, wage growth and a serendipitous lack of inflation. With that as a foundation, what’s actually occurring in this economy is the globalization of assets and wealth. That is to say, because the value of American labor is falling so precipitously, (due to the utilization of cheap foreign labor around the world), the value of the assets held by them is falling in direct correlation with their declining wages. It must. A worker formerly employed in a lost economic sector, (manufacturing for example), earned between $50 – 60,000 annually. That job gets outsourced. Now that worker takes a job paying $20 – $25,000 annually. All the tax cuts, cheap foreign goods, and low paying jobs being created by President Bush and globalization aren’t going to restore this worker’s former standard of living. Presently, someone trying to pay down a debt service based on their former “un-globalized” salary, and prior level of affluence, just can’t do it. The fact is, now that America’s been globalized, that worker – along with all others of the same economic rank – can’t afford the assets they’ve purchased and are trying to hold on to. Just as wages within their economic sector are being deflated; so must the value of their assets be deflated. This has to occur so that new members of their socioeconomic group, those just entering America’s global workforce, can afford to participate; including those living and working here illegally. What we’re seeing now is just the beginning of a global revaluation; a downward harmonization of American worker’s livelihoods with the livelihoods of the world’s other working people. Furthermore, this state of affairs isn’t going to end any time soon; not until the descending worth (wages and assets) of America’s working classes, meets the ascending worth (wages and assets) of the labor they compete with globally. Therein lays the rub. Most of the rest of the world’s labor works for nothing, or almost nothing, and holds no assets. Truth be told, the only country whose entire economy has prospered due to Globalization is communist China; where free market capitalism doesn’t exist [officially] and where every societal need is [supposedly] provided for by the government. 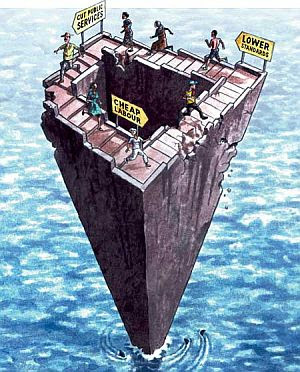 As Ross Perot so aptly phrased it during his debate with Vice President Gore in 1993, we’re in: “a race to the bottom”. Exacerbating this crisis is the fact that, while the wages and assets of those forced to compete globally are deflating; the costs of goods and services they must purchase to subsist are inflating. The primary sources of this inflation being deregulation and President Bush’s lust for printing money; principally to pay for the globalization of Iraq. As for the true health of America’s overall economy international spending is out of control; Iraq alone is costing American taxpayers over $412 billion! Yet the Washington oligarchs have no compunction. Across the board Americans have experienced the steepest decline in their standard of living since the Great Depression, as America become a debtor nation. Bankruptcies, home foreclosures, and personal debt are at an all time high, as is our trade deficit; while concurrently, real wages and property values plummet. Still Globalist fanatics boldly proclaim their manifesto: “Free Trade will promote a global ecumenism and provide us economic prosperity” All the while America’s two greatest exports remain her jobs and wealth. With the mendacious predictions which brought about Globalism in the first place, (being implemented without the true consent of the governed), and with America’s economic power declining; here’s the real question. What type of country is America destined to become in the twenty-first century? Perhaps the answer can only be found in the past. Perhaps in Charles Dickens in his novel, A Tale of Two Cities. About the author: I’ve been a lifelong resident of Bucks County, PA and am a married father of two adult children. After pursuing undergraduate studies in the 1970’s, I’ve acted in various capacities within the corporate setting.